But last week we said goodbye to Beecker the rooster. He was starting to crow beyond his couple of 7am calls to several calls during the day – because he could. So he left with me in the car on Tuesday for a property nearby. Come Saturday we bought home Stella from one of my wife’s work colleagues. 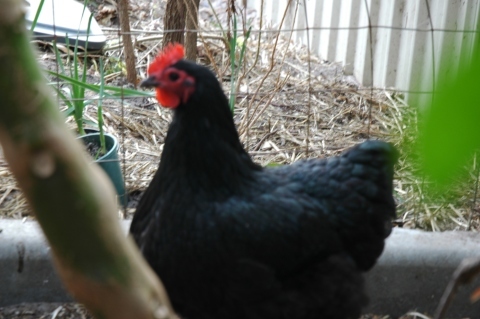 Stella is a rather large, dusty black Australorp. Penny immediately set after her and tormented her for a while. We didn’t get to put them back in the coop tonight but on our return home there they all were, perched away out of the wind and rain in the coop. No signs of chaos. After Penny has taken Jennifer Aniston ‘under her wing’ since Beeckers departure I am sure she will eventually give Stella some slack and they will all settle down to a relaxed trio and start up with the egg laying again. I have also put a small aquaponics project together over a couple of days, but I’ll do another post on that itself at some point. That’s all for now. ← Aquaponics Project – Some Musings.